‘None Of The Above’ (NOTA) was introduced in DUSU elections last year. Since then, it has gained popularity as represented by the number of voters opting for it. Here is a look at why this is happening. Three years and four rounds of national assembly elections ago, the ‘None Of The Above’ (NOTA) option was inducted into the Indian electoral system. It was only in 2016 that the Delhi University Student’s Union (DUSU) election followed this trend. The concept of NOTA is democratic, as it gives the voter an option to reject an electoral candidate. It represents dissent and showcases that the voters are not satisfied with the particular candidates representing a specific manifesto in an election. However, the question then arises: Is NOTA really influential practically? In our electoral system, NOTA in status quo, has no electoral value. Even if the situation emerges where NOTA gets more votes than any candidate in the elections, the candidate who has secured the highest number of votes after NOTA will still hold office. This expression of rejection through casting your vote guarantees no accountability, since it does not constitute a re-election or change in candidacy. The very fact that NOTA is emblematic is the dreadful reason why it cannot be successful in an illiterate and puerile democracy like ours, where charisma and ascendancy are given more significance than one’s ability to introduce and implement affirmative policies. The foundation year for NOTA in the University of Delhi (DU) saw more than 16,000 votes being cast in its favour. This year, the number skyrocketed to a total of more than 29,000 votes. Even though NOTA is heavily symbolic, the fact that it is gaining traction within the university means that the students are getting tired of the aggressive and “rowdy” behaviour of the supporters of DUSU candidates. The students have finally been given a platform to express their dissent through the same. Across the university, students have often complained about their classes getting disrupted during campaigning, bribes in terms of free movies, trips and meals being offered to students living in Paying-Guest accommodations and so on. Political parties, allegedly, go as far as to distribute alcohol and chocolates to students one day before the elections. 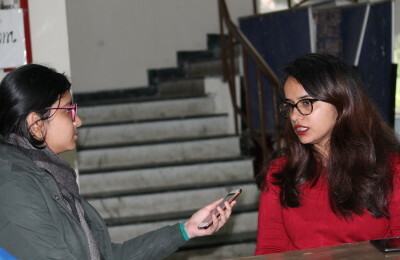 Many female students have come up and voiced their opinion about feeling unsafe in the campus during the time of elections, despite the tag of ‘women empowerment’ being included in every party’s manifesto. Repeated promises, no implementation and the ongoing tiff between the two leading parties (ABVP and NSUI) often create chaos in the university. It has affected the peaceful functioning of the University, and these thoughts of the students are very well resonated with the rise in the popularity of NOTA. Despite its shortcomings, NOTA, in theory, is imperative in terms of facilitating and allowing an expression of dissent; however, it still requires severe changes in its actual implementation.